One fine day, Kedaar took initiative to demonstrate some of his learning to mom/dad. He is able to clearly write alphabets, 1-10 numbers. Kedaar when we were coming back from school on Friday..
[Kedaar]Mummy, bear is my baby. Can you put blanket to her? [Kedaar]Mummy, bear is hungry, she wants milk. [Kedaar]Mummy, can you take care of my baby, I will sleep. can you be careful and gentle with her, she might fall. Thats very sweet of him (I dont have any clue about this India baby story though, will wait for him to bring it up again). I am sure I read this as part of my English textbooks when I was in school. But it was pleasantly and inspirationally reminded by Dr. Jayaprakash Narayan (Lok Satta) in the context of society, politics, but this is so true for any aspect mainly education. Great poem and I would like to Kedaar to read this when he grows up. my Father,Let my country awake. Also I read some thoughts of Ravindranath Tagore about education. Really true "especially" the highlighted aspect. How to watch "Tom and Jerry" videos whereever you want. Kedaar became expert in handling iphone now a days. He watches "Tom and Jerry" by going to YouTube and he is tracing letters in an app we have downloaded called IWriteWords. Step 1 : First, cry, shout,divert or do something to get hold of mamma's or daddy's iphone. One common thing that works with my mamma when I am in car is to ask "Mamma, can I please sit in your lap". With the fear that I come out of car seat, mummy will say "no you need to sit in car seat, otherwise it is dangerous, I will give you iphone so you can watch tom&jerry, ok?" step 3: Now the fun starts. Click the one and only button available on iphone at bottom. that should be easy to figure out. Press it 2 times, just in case you are not getting to the starting screen. Step 4: Press "the YouTube" icon. I am sure you know that because you must have watched your mamma, daddy doing it sometimes. step 5: when you go to "YouTube" , carefully look at the options below and choose . the 3rd one (it is search). You know when you are in there. Step 6: The default text in there is "Tom and Jerry" (atleast that is how it is in my mamma's phone). Wait for the the list of tom and jerries to show up. it takes some time. tom and jerry" for hours and hours. In the last 2 months, Kedaar got fever 3 times so far and the cold, cough are not leaving him at all. Especially at nights, he is uncomfortable with cough. Doctor treated him with anti-biotics for sinus infection recently and he was better for a couple of days. I think its just constant weather changes which is causing this. Then again , he got ear infection and teary eyes on 5/4 along with cold again. Doctor started on new anti-biotic again. He was OOF for a day from school and started going from the next day itself. The cold however is still going on and yesterday it turned into fever, cough again. We went to doctor today and they got him started with 3rd anti-biotic to see if this will help. He has very high fever today. One thing we really appreciate and learn from him is his courage. He tries his best to stay normal , tries to play. May be kids are like that. I hope his fever reduces and he becomes normal soon with the rest in weekend. Kedaar's school has Karate classes where interested kids can enroll and learn. 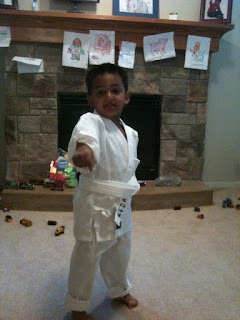 Around 2 months back or so, I asked Kedaar's class teacher to send him to trail class so he can see if he likes Karate. Kedaar went to Karate class that day and he didnt talk about it a lot. So I assumed that he may not be ready yet for that class. Also the brochure that the Karate teacher gave said that the min age for it is 4 yrs. Last week I got a call from Karate teacher asking if we plan to enroll him. When I asked details he said that Kedaar has been coming to his classes for 5 wks or so and said that he will not get karate uniform unless we enroll him. I was surprised ! We didnt even know about it. When I asked Kedaar about it, he said "Atharva, Anirudh is going , so I also went with them, I like it mamma". The class teacher also thought that we enrolled Kedarand hence she let him go. Kedaar demonstrated some of the lessons his "sense" (karate teacher) taught him like punching etc. Overall we are forced to join him in the Karate classes and he started officially this week. we visited SFO for 3 days last weekend. It was a sudden trip where Chandra was going for a conference for a couple of days and I & Kedaar joined him to use it as an opportunity to see Neelima (my friend)'s son Neerav. We stayed in SFO for 3 days. Along with Neelima, we also visited several other REC friends. Kedaar met lot of friends namely Anushka, honey akkalu, Neerav, Nikila, Pranav, Sandilya, Sindhu & Veshaal.It was a fun trip without any touristy activities. Kedaar's schools had a mothers day teas party last week. The party was from 10-11.30 in the morning. When mommy arrived, each kid picked up their mommy from door, showed her the chair she needs to sit in. It was 3 presents for mommy, a tea pot shared greeting card,a mom card and a vase. Then all the kids sang 4 rhymes that they have practising beautifully ( I am very little tea pot, Hickory dickery dock, fuzzy little caterpillar, littfle ms muffins). After that each kid, said a statement about their mommy and gave flower. Kedaar said "I love my mommy because she gives me kisses :))". Some kids said "I love my mommy because she cooks food for me, she plays memory game with me" etc . After that we had cake, tea. I have been getting hints about the party, the songs they are going to sync, the gifts from 2,3 weeks before , so I know how much they prepared for it. It was very nice party and lot of fun. In the past 2, 3 months, Kedaar really got into the phonics and also learnt rhyming sounds. It just came so naturally without us putting any special effort at home. Related to phonics, for all the words, he started saying the starting sound like "ka ka Kedaar" , "la la lunch" etc. For any word we speak, he will try to get the starting sound and try to say the associated letter. He also wants to play the game of me or Chandra saying a sound and he will tell several words that start with it. His school teacher has been doing sounds/words during circle time over several months and now they are doing blending sounds like 'sm', 'fl'. This week their sound of the week is 'cr' and I asked him on last friday on what the sound of the week is. He said "mummy, it is 'cr', 'cr','cr', crawl, crash,crab,crocodile,cry" etc. He could come up with so many words instantaneously and it was lot of surprise to hear that many words from him. For rhyming words, he would ask us to tell one word and he will come up with rhyming words like cat, bat: snake,cake:later,matter etc. During the process of coming up with rhyming words, he is also inventing some words :) He invents the word and sayd "Mamma, this is a very good word". I love the way kids learn things here, so systematicaly, so naturally that I dont think they will ever forget. Not sure about other schools here, but I really like the montessori system for the way they teach things. Without a doubt, we will continue him in the same school, same class in next year as well. Kedaar is fairly good in eating food that he likes, but he is not open at all to try new things. Specifically he doesnt eat anything other than waffles (no bread, no cereal) for breakfast, no curries with rice, no curd rice. He doesnt even want to try taking a bite irrespective of all dynaosaur, scary things, strong boy stories. So the only thing he will eat with interest is lentils and often he used to get bored just with one variety at food. It is also so frustrating to see him rejecting all the things I spend so much time and effort to prepare. We tried eating together at dining tables, doing the tasting bite strategy and nothing worked. In the past 2 weeks, we are trying a different thing which is racing. So Chandra and he will sit at dining table for breakfast and every day we will have a different type of race (Idli race, cheerio race, breaf race, pancake race). Kedaar started enjoying thing althought we have to keep on encouraging that he has to win over daddy. So after 2 weeks, he is in a state where he puts few bites in his mouth for breakfast. Also for curries in dinner, I started "3 yr old, 3 bites" game where he has to try to 3 bites of every curry I make even though it is difficult for him. He is managing to try that also. We eventually have to extend this for curd rice slowly. I am very happy with the progress and hopefully it lasts for some time.